Assignment 10 of the Society of Botanical Artists Distance Learning Diploma was entitled ‘Working from Photographs’. We were supposed to take our own photographs, and create a design in the form of a greetings card or poster. I do incorporate the use of photographs when I am working on a project, I think a lot of artists do. I like to work from life as much as possible, but I take my reference photos early on as almost always you are still painting when your specimen has long faded! It’s useful to return to the photograph and use those in combination with early studies and sketchbook work to continue the piece. However, I didn’t realise until working on this piece how important it is to take goodphotographs, and how many tricks there are to make your life so much easier when it comes to using them as your reference. It is so important when you’re taking photographs to have the right light source. Ideally, natural light. Ideally, outside. I also tried to get my light source coming from the direction I will paint it (for me, from the right), although this can be difficult when outside. Photographing your subject with a ruler in the picture. So simple. I’d never thought about it until this assignment. And so effective! 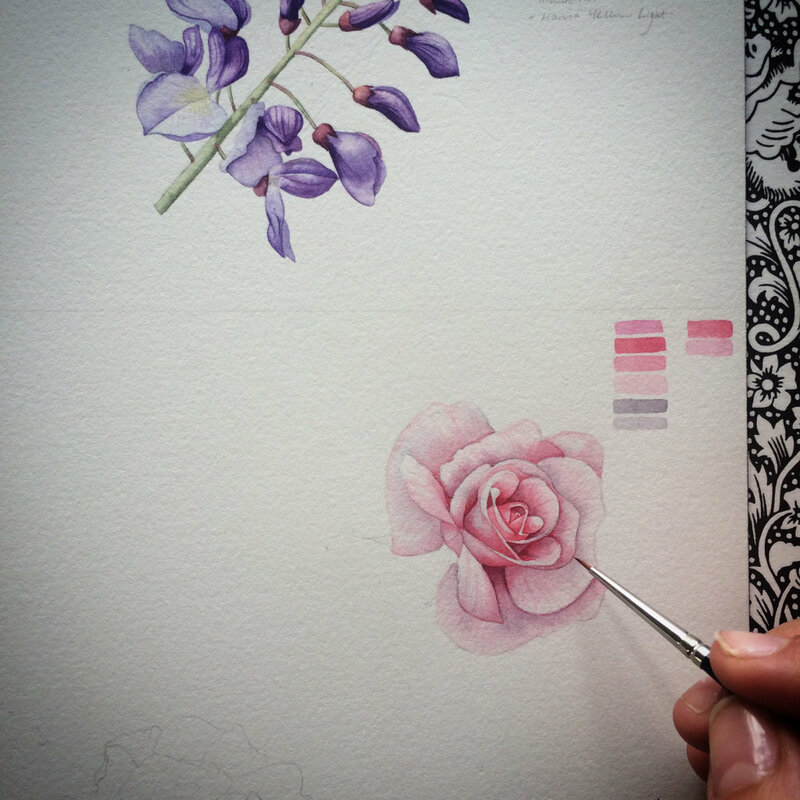 Botanical illustration, as I’m sure most will be aware, is all about scientific accuracy. It would be so easy, if working from photographs alone, to lose that by not taking accurate measurements. As always, I started my work with sketches and studies in my sketchbook. This is so crucial to the final piece. It’s where you draw your subject, make your colour mixes, and most importantly, make your mistakes. At the time of this assignment my Mum’s wisteria was in full bloom. 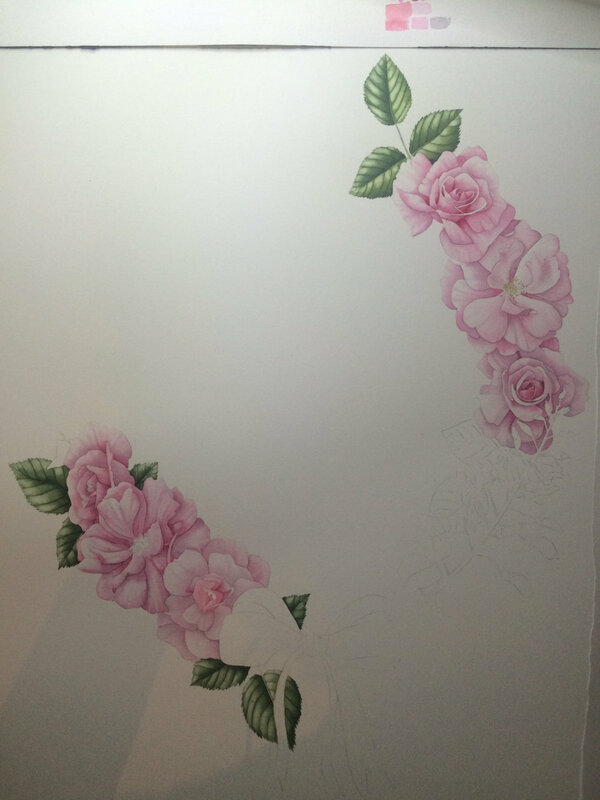 I knew that I wanted to include it in my assignment as I had the freedom to include any flowers I liked with this one. I love the curving nature of each bloom and I could instantly picture how nice it would work as part of a wreath. To help me with the composition I actually constructed a physical ring out of a piece of plastic to place the components around, both physically, and on the paper. When it came to constructing the main piece, I used a combination of gridlines and tracing (*shock!*). I actually found tracing to be a really effective way of transferring the photograph on to paper. I did have to make sure, however, that I was incredibly accurate in what I was doing. Once I had the flowers arranged how I liked, I then cut the piece of paper in two, and worked with different placements of each arm (for example more open at the top, and more closed). Finally I added in the ribbon at the base, which I drew in freestyle. 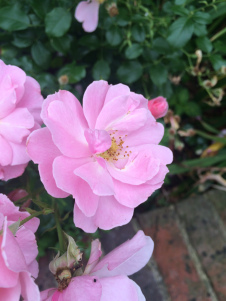 The photographs below demonstrate my process of painting the roses. 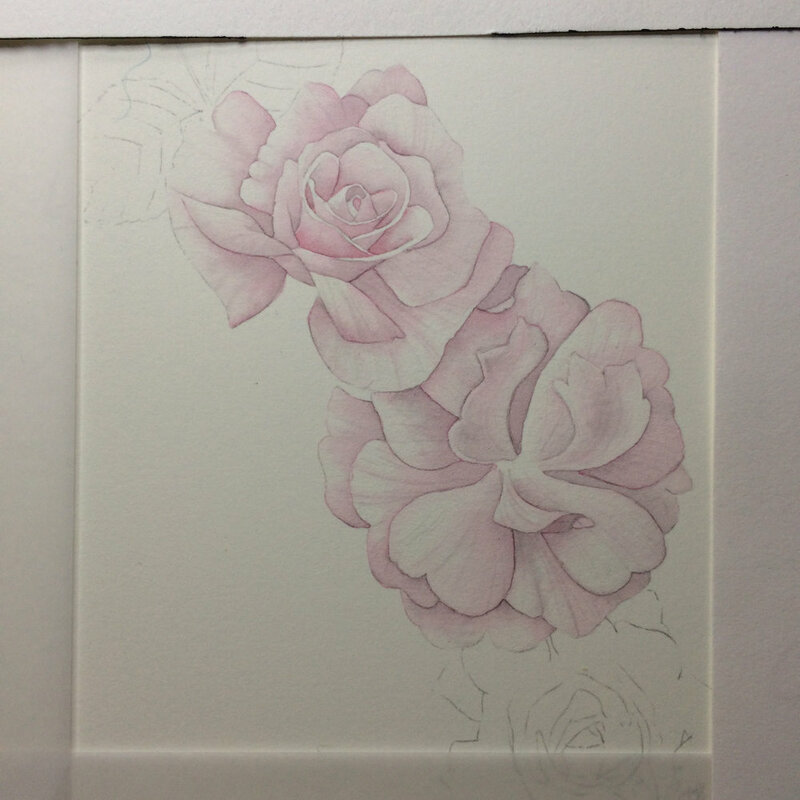 My initial botanical grey wash goes down first, and then the first pale pink tea wash on the roses follows. You might be able to see that I have quite harsh edges to my washes. This led me to contemplate restarting, however I persevered, trying to soften them as I progressed. I worked simultaneously on both collection of roses so that my technique remained consistent. I loved painting the delicate purples and blues of the wisteria. I'd love to do a larger piece one day. They said that my colours were excellent, with crisp edges and detail. I received some criticism for not stating my intention of the design clearly, and not supplying and ideas for wording in the centre. My final mark for assignment was 9.16 out of 10. I completely overlooked the design element of this assignment, i.e. providing the tutor with an idea of font, lettering and wording for the card/poster. That let me down. I learnt some valuable lessons about taking and working with photographs, although it is definitely something that I will need to keep practicing. Photography course perhaps?